The kitchen is among the most important departments at any healthcare facility. Running an efficient kitchen that turns out tasty, nutritious meals reliably and cost-effectively is vital to the overall success of the hospital - and to the satisfaction of its patients. Food tray presentation is one key aspect of food service to master in order to keep your facility’s patients happy and healthy, stay within budget, and maximize your Press Ganey scores. Improving your meal tray planning and execution has several benefits - read on to learn how this simple tweak can improve your operation significantly. Of course, the primary goal of preparing and delivering food in a healthcare facility is for patients to eat it – the better they eat, the better they heal. An attractive and thoughtful presentation can go a long way in encouraging this. The same meal, with the same ingredients, prepared by the same chef, can seem entirely different when plated well compared with when it’s simply slapped on a plate. Our selection of trays and dining ware combines form and function. Our non-skid trays are the perfect base, with a secure grip and a surface that keeps items from sliding around during delivery. We offer a wide range of dining ware and domes, like our Fenwick line, which is thoughtfully designed to make patients feel at home and at ease. 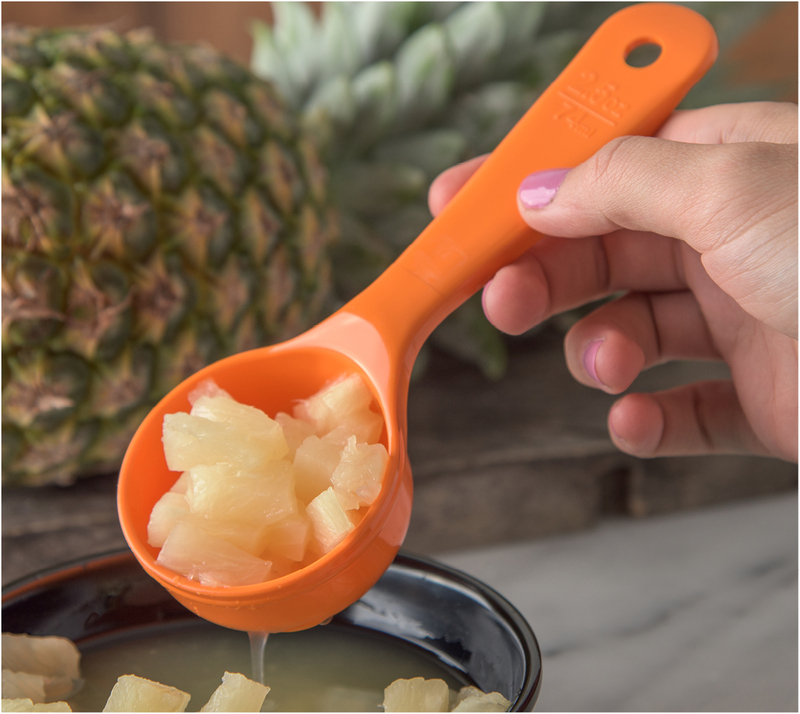 A wide selection of accessories - bowls, utensils, caddies, and more - rounds out our presentation lineup. If you’d like to improve your dining presentation, get in touch with our consultation team. We can help you come up with ideas and point you to products that can make a big difference. 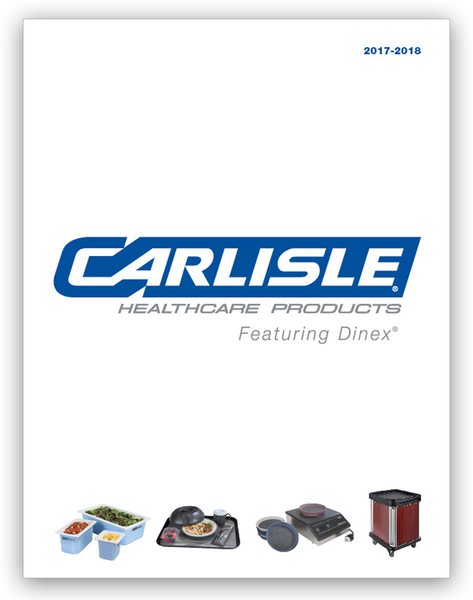 With Carlisle, you can make your food service feel like a favorite restaurant - and your patients will be thrilled. Admitted patients have diverse nutritional needs based on their physician prescribed diets, allergens, diet consistency, and personal preferences as varied as each patients’ backgrounds. This means that diets can differ greatly from patient to patient. This can make for a tricky situation. It is critical that dieticians, dietary managers, and culinary teams collaborate on patient care. But with good meal planning and the right equipment, individual nutrition requirements can be met. Our culinary team can help you handle menu planning, serving, and delivery, and can introduce you to products that can eliminate the headaches that often come with complicated nutritional requirements. 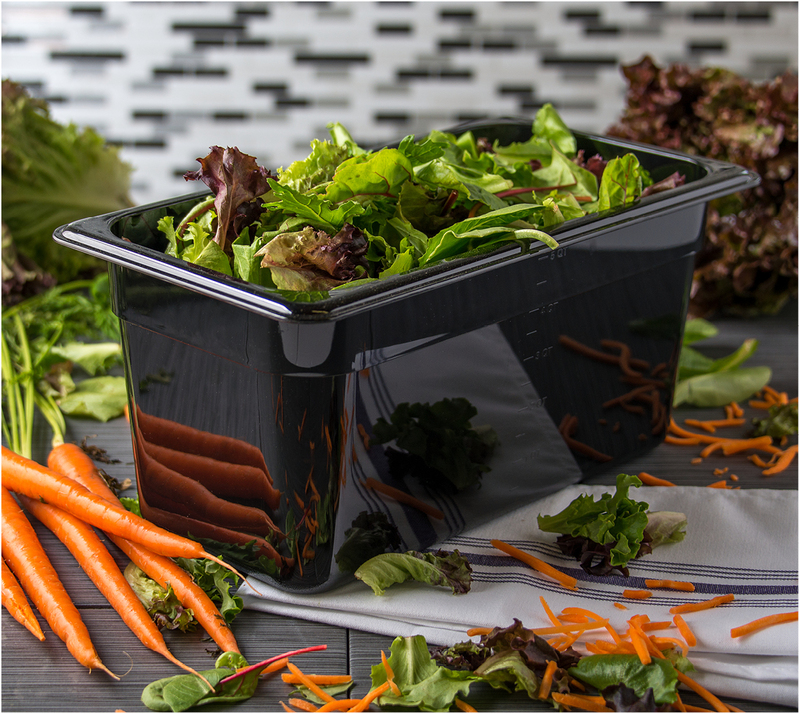 You may try utilizing our color-coded storage containers to stay on top of special ingredients and potential allergens. 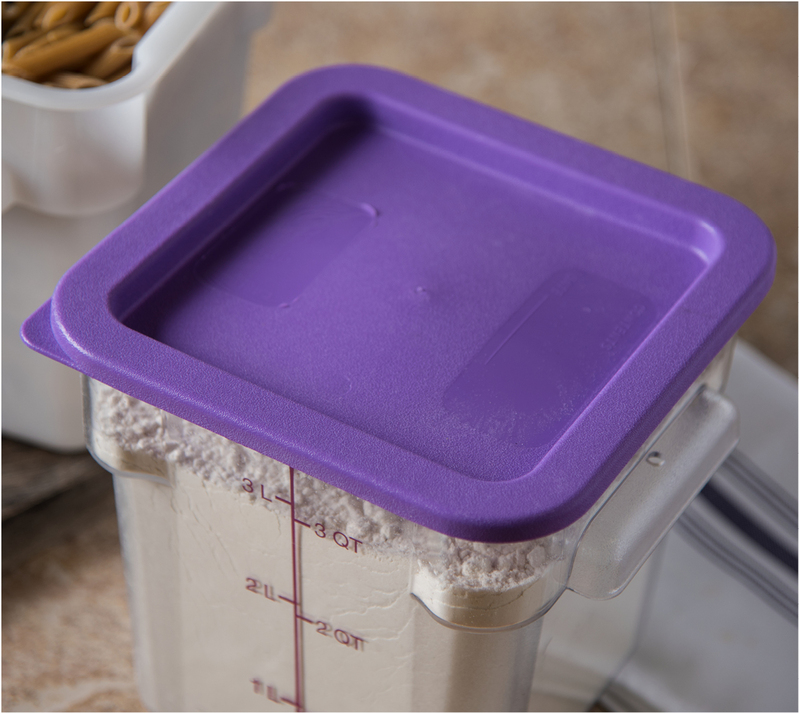 The tight-fitting, color-coded lids encourage organization and reduce cross-contamination. Optically clear containers allow a quick view inside, and you know what remains with molded-in capacity indicators. Transporting full containers is easier with comfort-grip handles. While receiving medical treatment, it’s generally not good for patients to gain weight or lose weight. Many patients are unable to get much physical activity and proper nutrition which can result in changes in weight. Patients who are particularly susceptible to fluctuations in weight, strictly monitoring caloric intake is crucial. This means that every serving of every dish at every meal needs to be measured and served precisely. Even a few extra grams of some foods can tack on undesirable calories - just as a few grams too few can add up over days and weeks and cause a patient to lose weight. Our preparation and serving equipment – measure misers – makes it easy to scoop servings precisely, maintaining control overweight and the nutritional health of your patients. 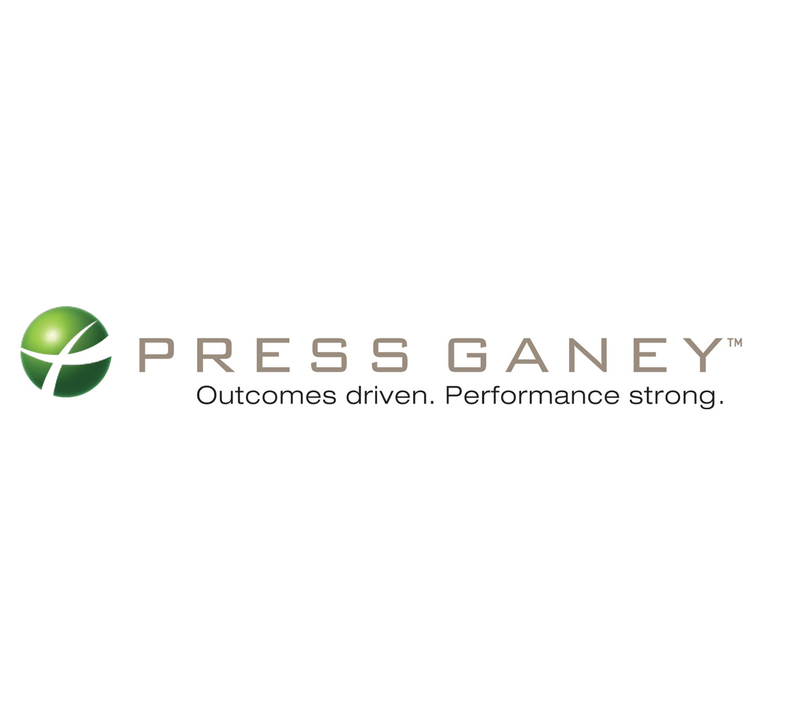 Their treatment is likely to go much smoother this way and will benefit your Press Ganey scores. When your patients eat all their food, get the nutrition they need, and maintain a healthy weight, they’re likely to be extremely satisfied with their dining experience - and your finance office will be in good spirits, too. Eliminating food waste is a major benefit from a financial perspective. Appetizing, nutritious food, served hot, on time, and well-presented, is likely to be eaten. This makes it easier to plan and allocate resources in the kitchen. Properly planned and allocated resources supported by proper portioning, storage and handling practices can reduce food waste and cut costs even more. 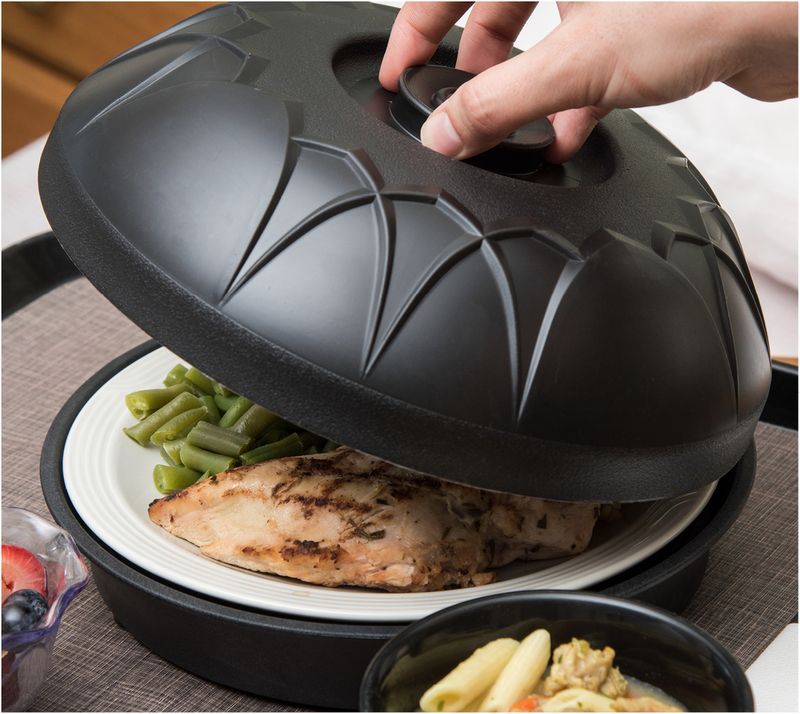 Carlisle offers solutions for these activities like six-inch-deep, ninth-size food pans that hold as much as four-inch-deep, sixth-size food pans. We also offer silicone basting brushes, storage boxes, San Jamar Saf-T-Wrap and a range of kitchen scales to reduce waste even more. Avoiding penalties and fines from regulatory agencies is another boon - these fines can be steep and often invite greater scrutiny. Furthermore, patients who maintain a healthy weight and get all the nutrition they need in their diets are likely to see significantly better results in their treatment. An efficient kitchen that takes a little extra time to prepare delicious food, presents it well and with a courteous demeanor will achieve a direct and significant improvement in patient satisfaction and Press Ganey surveys. At Carlisle, it’s our job to make your kitchen run better. Our unique, four-team approach to healthcare foodservice support allows us to do that. We have dedicated teams for certified sales, custom engineering, temperature control, and culinary expertise. We would love to work with you to improve your processes and supply you with the best tools available in the industry. Get in touch with us today - we look forward to starting the conversation.